All-New Stamping offers value-added services as part of our turnkey stamping solutions including Machining Services. Machining Services are available throughout the manufacturing process and are used from the development of tooling for dies throughout product finishing. Some parts can be more efficiently manufactured using machining rather than stamping. Our staff will work with you to redesign the part so that it can be machined to meet your exact specifications. 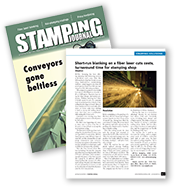 All-New Stamping’s machining services meet high quality standards and tight tolerances. Our process is AS9100 and ISO 9001 certified and we adhere to NADCAP standards. At All-New Stamping, our customers come first. Our core values of listening to you and delivering high quality products every time bring added value to every part we produce. about Metal Stamp Machining Service?